You’ve probably heard of Orlando for its incredible theme parks. But guess what – your trips aren’t just limited to Disney World or Universal. An ideal destination for a family trip, Orlando comes with hundreds of unconventional activities for your short as well as extended itineraries. Interestingly, most of these options cater to the whims of night owls. So if you love heading out after sundown, here are couple of fun, exciting and unique tours that’ll totally blow your mind! If you’re looking to bask into the scenic beauty of Orlando at night; this helicopter Night Boat Tour is exactly what you need to try! Departing from the Kissimee Gateway Airport, this trip covers every leading spot of Orlando. So whether it’s Disney World, the Coca Cola Orlando Eye, Universal Studios or Sea World – this trip will cover it all! What To Expect From The Helicopter Night Tour? Safety Brief – Once you check in at the departing point, you’d be given a clear safety brief that’ll inform you about the nitty gritties of your trip. Spot the Landmarks – Right after that, you’ll board your flight and the pilot will guide you across the skies while covering the biggest attractions of the city. So, glide across the ‘Orlando Eye’ or catch a glimpse of the Disney Fireworks as you head out for an unforgettable, once-in-a-lifetime experience. Ideal for thrill-seekers, Florida’s Airboat Adventure Night is meant for those wild spirits who aren’t yet ready to be tamed! This sixty minute tour will take you across the dark swamps of the city where you’ll get to see rare wildlife, amid a picturesque natural setting. What To Expect From The Airboat Adventure Tour? Departure – Departing from Southport Rd, this trip will begin at 7:30 pm or 8:30 pm depending on the size of your group. Airboat – You’ll find yourself in a 17-seater airboat with like-minded adventure enthusiasts who are looking to seek just the kind of fun that excites you to the core! Local Guide – Once you’re up and ready, your tour guide will explain the habitat and lifestyle of the local alligators, as you witness them in their natural habitat. This is perhaps your only chance to get a first-hand view of wild alligators in the city. Picture a scene where you’re kayaking with your family under the beautifully starlit sky. In this quaint setting, there’s nobody to disturb you. Away from the bustling crowd of Orlando city, you’re gliding across the water with the people you love; the people who truly matter to you. If this scene excites you, the evening kayaking tours in Orlando can be your best bet! Here are a few tours you can try. Commencing from Florida’s Meritt Island, this ninety minute night kayaking tour takes you to the neon-lit Banana River, the spectacular Indian River Lagoon and the Meritt Island Wildlife Refuge Center. Enjoy the amazing visibility and detailed insights from the tour guide. As the sun starts setting in Meritt Island, Dolphins and manatees move back to their snuggly spots. Interestingly, it is also during this time when the other forms of wildlife gets really active! Right after sundown, more than 358 species of birds flock around this island to finally head back to their protected nests. Watch rare birds like Ibis, herons, spoonbills and cormonants as your guide informs you about their natural habitat and lifestyle. Unlike any other tour, this two-attraction pass gives you a chance to experience Orlando’s top attractions in a single day. 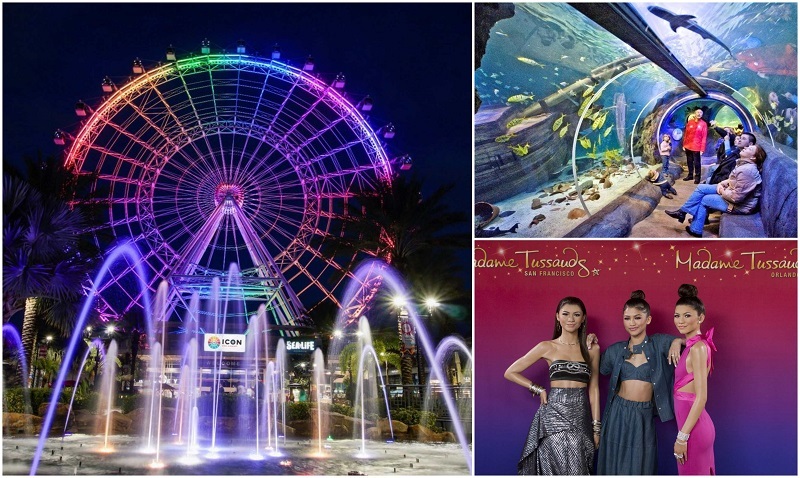 You can choose to visit either Madame Tussauds or SEA LIFE Aquairum and then finish off with view of Orlando on the Icon. What To Expect From The Icon Orlando Tour? Madam Tussauds Wax Museum – This the famous Madam Tussauds wax Museum that features more than 200 life-like wax statues. So visit the museum, take some photos with the wax effigies of your favorite celebrities and create wonderful memories like never before! Sea Life Aquarium – A perfect mix of educational insights and underwater fun; the Sea Life Aquarium is one of the best spots to explore the authentic underwater habitats in Orlando. This aquarium features more than 5000 creatures, a massive ocean tank and a fascinating video theater. If you’re fond of sea creatures, this will be one of your favorite spots in the city. 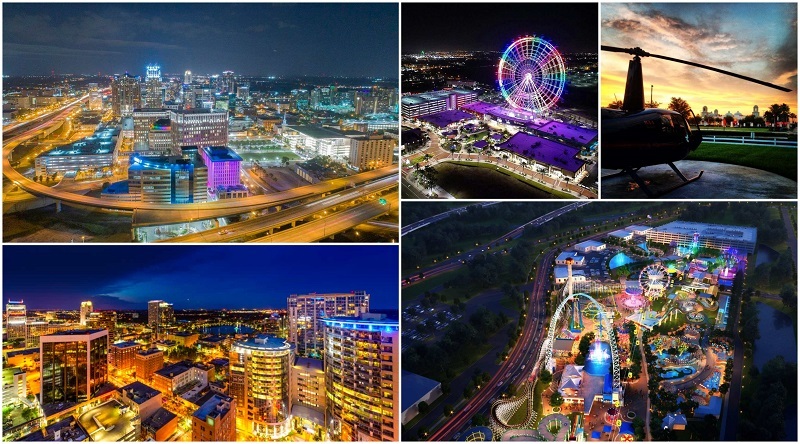 Icon Orlando – A perfect break from the bustling city-life, The Icon Orlando will offer an amazingly unconventional view of the city at night. Simply hop into your capsule, as you soar amid the blue skies and get amazing views of the city. Orlando has some of the best dining options at night. Whether it’s a hearty meal of burgers at Planet Hollywood, an exotic Titanic-esque dinner gala or a full buffet meal with your favorite Disney characters – Orlando will have you covered! Nestled in the heart of Disney Springs, Planet Hollywood is best known for its sumptuous meals and hearty desserts. You can always head to this spot for a meal of salad, sandwiches, mac and cheese, and unlimited soft-drinks. You get to enjoy all of this, under the backdrop of a massive memorabilia of classic movies. Opening hours – Daily, 11 AM to Midnight. Perfect for couples, this Artifact exhibition dinner is meant for everyone who’s looking to spend some ‘we-time’ amid the classy backdrop of Titanic. As a part of the dinner show, you’ll get to interact with the passengers of the Titanic and witness a re-enactment of the tragic shipwreck. The Disney character Dinner is ideal for families with Disney-addict kids. Once you sign up for the trip, you’ll be given a special limousine transfer to Chef Mickey’s Restaurant at the Disney Resort. The trip includes a full buffet meal, your fuel surcharges, additional taxes and most importantly, a fun night with your kids’ favourite Disney characters. If you have an active and competitive family, Indoor Kart Racing would be a fun option. Ideal for both warm and rainy days, this will get your adrenaline levels high with its top notch electric race cart and more than 60 different arcade games to pass time. What other activities are available beside kart racing? Arcade games – Your kids will love the entertainment with over 60 different arcade games to choose from. Bowling Alley – Another competitive activity for the family, knock down as many pins as you can and score a few strikes! Pool tables – Enjoy an easy game of pool after the adrenaline of racing around a track. Bar & restaurant – Best to have dinner and drinks after racing. You don’t want to throw up from the excessive speed in your karts. Being the only upside-down attraction of the city, Wonderworks truly turns your world ‘upside down’! The Wonderworks is an amusement park that features hundreds of interactive activities for kids and adults of all ages. What can you expect at Wonderworks? Interactive Games – Unconventional artifacts, unique games and interactive activities are only a few among the hundreds of attractions at Wonderworks. Outta Control Dinner Show– If you upgrade your pass to a VIP one, you also get to enjoy the Outta Control Dinner show. This show gives you a chance to enjoy the hilarious comedy performances while feasting on an amazing dinner. Like Wonderworks, this is another attraction that opens doors to the world of the bizarre and uncanny! This family friendly museum is ideal for anyone who loves exploring the oddities of life. 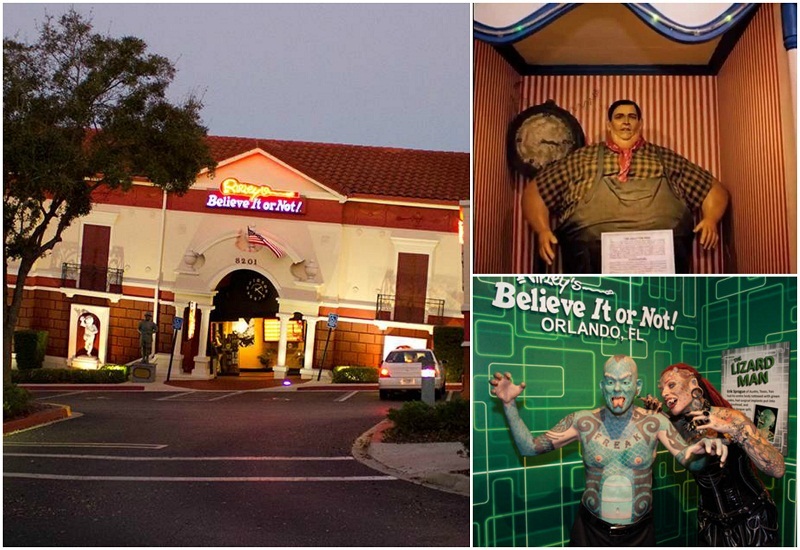 What To Expect From Ripley’s Believe It Or Not Tour? Weird Artifacts Exhibition – As you enter the museum, you’d be amazed with the fascinating display of more than 16 weird exhibits. The Classic ‘Odditorium’ – The museum is located in a massive ‘Odditorium’, the shape of which alone will completely blow you away! Self Guided Tour – Take your time and learn about all the oddities on our planet. There are some things you simply can’t learn at school. With roller coasters, adventurous rides, go-karts and arcade games, Fun Spot America lives up to its name in providing a fun and interactive experience to your family. This theme park is a perfect spot to spend some wonderful ‘family-time’ at night; and with its free Wi-Fi and parking spot, you’re sure to get your money’s worth. 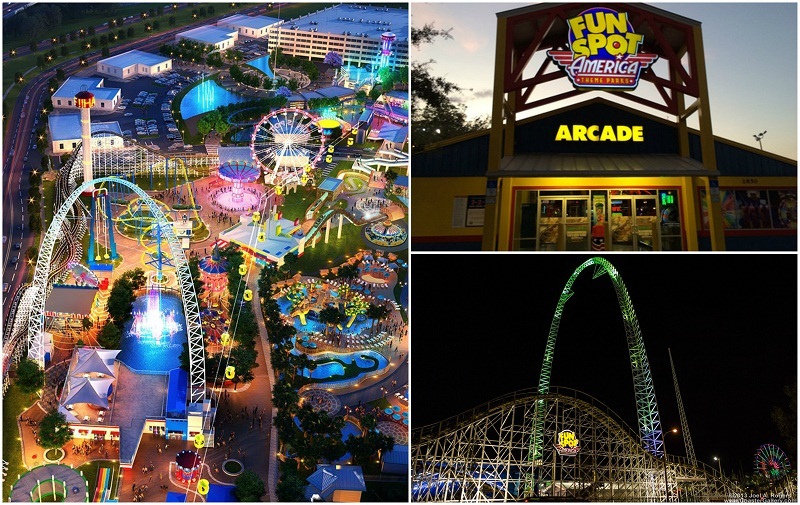 What activities and rides are at Fun Spot America? Rides, Go-Kart and ‘White Lightning’ – You’ll get a chance to jump on some amazing rides including the popular go-kart course. While most of these rides are incredibly exciting, a highlight is ‘White Lightning’ which is the only wooden roller-coaster of the city. Skycoaster Ride – Try the tallest Skycoaster of the world. Yes! This 300ft Skycoaster will spike up your adrenaline levels like never before. Classic Arcade and Video Games – In case you’re not too fond of thrilling or adventurous rides, try the classic arcade and video games. There are 100+ classic video games to keep you busy. Located at the I-Drive 360 Complex, the King’s Bowl is one of the top entertainment complexes in Orlando at night. This sprawling 30,000 square foot complex comes with more than twenty bowling lanes, stunning billiard tables, 15+ shuffleboards, 20+ ping pong tables and a huge bocce court. So if you’re looking to spend a fun gaming day with your family, you’ll find no better spot than this one! What To Expect at Kings Dining & Entertainment? Incredible Bowling Lanes – Once you sign up for this tour, you’ll get a chance to access the amazing bowling lanes in the iDrive Complex. Each of these lanes are equipped with high-end facilities and the gaming options are extensive. Ping Pong and Shuffle Board – You can start off with your two free bowling games at any of the 22 bowling lanes. Right after that, choose from the ping pong or shuffleboard for some added fun. Delicious Meals – Finally, when you’re done with the gaming, head to the food court for a delicious meal of pizza, steak, cocktails and craft beer. The fun and peppy meals will surely end your trip on a good note! With more than 200 wax effigies of your favorite celebrities, Madam Tussauds Orlando is an ideal spot for photography enthusiasts. Take as many photographs as you can with your favorite movie stars, celebrities, athletes and historical legends. Additionally, you will also get access to the special, theme rooms. Head out with your family and pep up your average day hanging with all the celebrities. Madame Tussauds in Orlando stays open til at least 10pm so take your time. What To Expect From Madame Tussauds Orlando? 200+ wax effigies – As you head out for this tour, you’ll find yourself in an incredible museum with life-like statues of every famous celebrity you know of. Special Theme Rooms – After seeing the celebrities from up and close, you can head to the special theme rooms which feature statues of leading A-listers of Hollywood. So watch them, get photographed and know everything that you always wanted to know about sculpting. Orlando has some of the best live shows in the evening with dynamic performances and interactive fun. You’ll find some of the most unique shows in the country and regardless of what you decide to see, you won’t be disappointed. Here’s a list of the top entertaining live shows in Orlando at night. Enjoy authentic flavors, spectacular performances and full-on entertainment at the Mango’s Tropical Cafe Live Show. One of the newest and biggest restaurants on the International Drive, The Tropical Cafe will offer you a truly unforgettable nighttime experience. Enjoy a sumptuous gourmet meal with your loved ones, as leading performers entertain you during the night! Head back to the 11th century with this European-styled live dinner show. Set in a 11th Century European-styled castle, this show features exotic artifacts, shining armors and elegant Spanish coats from prestigious families. Alternatively, it will present a classic European sword-fight with awe-inspiring falconry and fascinating horsemanship that’ll keep you mesmerized throughout the entire evening. The best part is, you get to enjoy all of this while gorging on a classic gourmet dinner with the best European delicacies. Witness a wonderful celebration of technology, art and music with the Blue Man Group Show Tour. Unlike any other tour, this one comes with brand new performances from leading entertainers across the globe. The incredible music makes these performances tad more enthralling. So if you’re looking for some interactive and creative show that’ll win the hearts of your kids, this is one show that’ll totally live up to everyone’s expectations. If your family is more active, loves puzzles and brain twisters, Escape Rooms could be a great night option to test everyone’s team work. Unlike any other American city, Orlando comes with the biggest selection of escape rooms. Here are some of our recommendations, but there are plenty more escape rooms to solve if you want to try one every night on your next trip. Do you want to save the White House from a sudden paramilitary attack? In case you do, the Crisis at 1600 is one of the best shows for you! This 90 minute show involves puzzles, quizzes and mind boggling trivia to keep you hooked. The show is available at various time slots and it also comes with complementary food and drinks. Do you have what it takes to save your country from a terrifying terrorist attack? If your answer is yes, this Bomb Escape Room is a perfect tour for you. Shrouded in pitch darkness, this Escape Room features shocking elements that’ll make your trip tad more entertaining. Commencing from the International Drive, this trip too comes under different time slots. If you’re fond of mysterious and thrilling games- America’s Escape Game is just the right option for you. Set under the backdrop of the chaotic Marshall Law, this game will take you on an adventurous mission to oust a deadly pathogen. Ideal for families with kids, this tour is wheelchair accessible and available for multiple slots. Your trip to Orlando will be absolutely incomplete without a visit to the top pubs and bars of the city. And this is exactly why you need to get your hands on a ‘Dollar Off The Drinks’ card. Access To the Top Bars – This card will let you access 50 top bars and pubs in the city. Get a dollar off when you show them your card. Senor Frog, Tin Roof and Whiskey Dicks are only a few venues among the many places that accept the card. Drink for 30 days – The card will last for 30 days. You’re bound to save a significant amount if you do plan on partying or drinking every night! Often touted to be the entertainment hub of Orlando, the Universal Citywalk is a three-block promenade that is teeming with the top retail outlets, restaurants, pubs and bars. You can stroll along the complex, shop to your heart’s content and feast on the delectable delicacies in this leading entertainment hub. What To Expect At The Universal City Walk? Restaurants – You’ll find plenty of mid to high range restaurants in this complex. Head to ‘Antojitos’ for some Mexican street food or ‘Bubba Shrimp’ for an authentic sea-food fare. In case you’re looking to try the classier options, ‘Emeril’s Orlando’, ‘Jimmy’s Buffet’ or ‘Hard Rock Cafe’ can be your best bets. 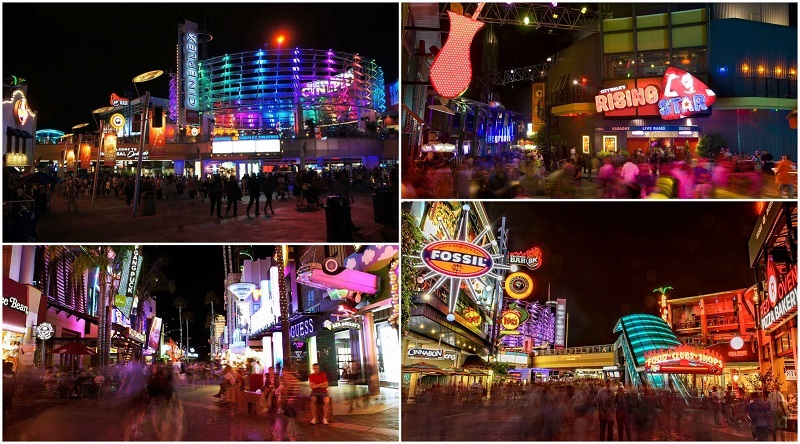 Shopping – Universal Citywalk comes with hundreds of leading retail outlets and most of them feature their logo or mascots along with other recognized brands. You can visit ‘The Island Clothing co.’ and ‘The Fresh Produce’ for pretty, chic and elegant clothes. Alternatively, ‘Universal Studios Store’ and ‘The Rock Shop’ are your ultimate destinations for souvenirs. If you’re out with kids, you can’t really miss this spot. Fun and Games – iFly and Howl at The Moon are two leading gaming hubs at Universal. While iFly features a makeshift tunnel for an amazing indoor skydiving experience; Howl at the Moon is meant for party lovers who are looking to enjoy a night of live music and unlimited drinks. Movies – You can also watch your favorite classic movies at the Universal Studio. You’ll find plenty of options to choose from in the 18-plex, 7-story I-Max theatre. Sing along the soulful pianos, choose from the exquisite dining options or enjoy some classic arcade games at the famous Disney Boardwalk. 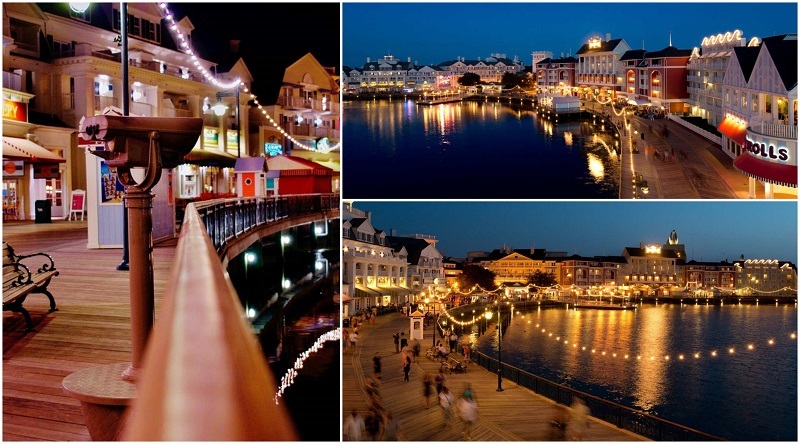 With unique shops and unlimited options for entertainment, the Disney Boardwalk is a favorite destination of night-owls. What to expect at the Disney Boardwalk? Live Jazz and Piano Duels – If you’re fond of the jazzy numbers from the 80s or 90s, simply head to the Atlantic Dancehall. Ideal for couples, this hall opens way to an amazing night of dance, fun and partying. Once you’re done with the dance, take a break on its balconies, watching the romantic views of the rippling Crescent Lake. In case you’re more fond of the soulful tune of pianos, visit Jellyrolls. Unlike any other spot, here, you get to raise a toast to the melodious duel between two piano maestros. The ambiance is perfect and the showmanship is sure to keep you hooked. Fine Dining – Disney Boardwalk also comes with an amazing selection of fine dining options. Whether it’s the Abracada Bar, or the Big River Grille & Brewing Works, you’ll find the best American street-fare at these spots. The beers are handcrafted to perfection and there’s also a special kid’s menu featuring top favorites like hamburgers, pasta, pizza and sandwiches. 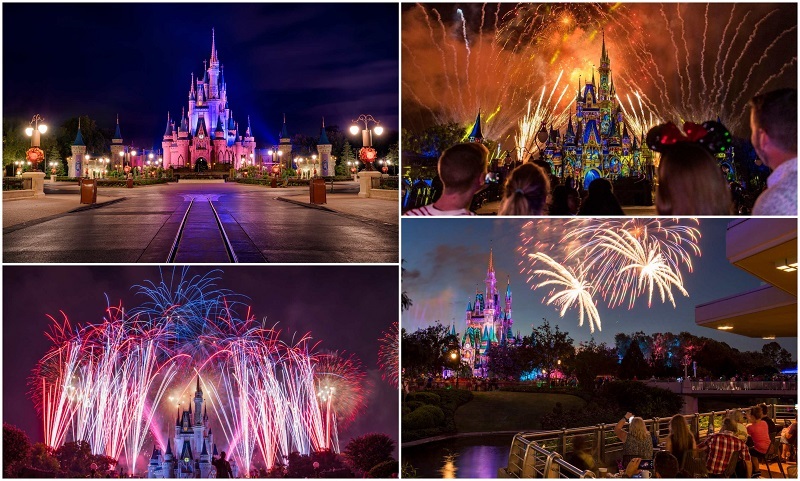 Experience the spectacular Disney Fireworks to end your trip in Orlando on a perfect note. A perfect way to spend your last day in the city, the magnificent Disney Fireworks will surely keep your whole family in awe. In case you’re not already inside the themepark, here are a few locations. Where can you watch the Disney Fireworks outside the park? The promenade at Disney’s BoardWalk. Capa at the Four Seasons Orlando. The marina at Disney’s Grand Floridian Resort & Spa. Narcoossee’s at Disney’s Grand Floridian Resort & Spa. The beach at Disney’s Polynesian Village Resort. California Grill at Disney’s Contemporary Resort. Eleventh floor at Reunion Resort. Characters In Flight Helium balloon. 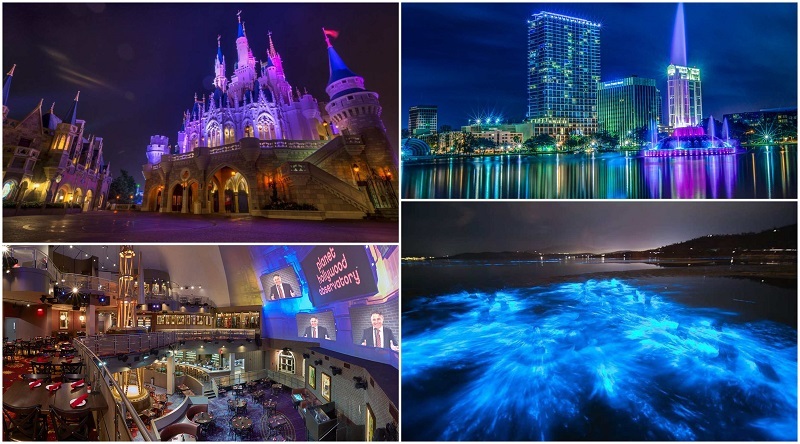 Well, now that you know the best activities and attractions in Orlando at night, choose your favorites and head out with your family for an adventure of a lifetime. If you have other suggestions, feel free to share in the comments below.